Whether porcelain crowns or veneers are used to enhance your smile, the truth of the matter is no one should know that you have had any work done, just that you look great. Admirers should perceive only a subtle change, something they can't quite put their finger on. In the end, it is you who will be exuding improved self-confidence. Nevertheless, from a patient's perspective, it is both helpful and important to know what modern dentistry has to offer. This article will focus on two innovative techniques and strategies to improve a person's smile. In many instances these two restorative techniques can produce nearly identical esthetic results, even though they are structurally different. When pushing the envelope to satisfy esthetic dilemmas, it is necessary to incorporate the latest in ceramic technology in both porcelain laminate veneers and porcelain crowns. Dental porcelains are used to create replicas of natural looking teeth for both veneers and crown fabrication. Although they share similar visual characteristics with natural teeth, one technique will be more suitable than the other, depending on the situation. As both a healthcare professional and artist, a dentist must take several factors into account when selecting which technique will provide an ideal restoration. Figure 1: A pre-treatment photograph showing two upper front teeth having surface imperfections that had been previously repaired with composite bonded restorations. Figure 2: A post-treatment photograph showing two veneer restorations reestablishing the natural beauty, form and function of the two upper front teeth. Figure 3: A photograph showing the top of an implant abutment that will need to be restored with a new crown. Figure 4: A photograph showing an all-porcelain crown. Figure 5: A photograph showing a porcelain crown cemented on top of the implant abutment restoring the natural appearance of the patient's smile. Porcelain laminate veneers are composed of thin ceramic layers that essentially replace tooth enamel. Similar to a contact lens for the eye, a veneer adheres to the outer surface of a tooth. Natural tooth structure must first be reduced by a minimal amount, approximately 1 mm or less of tooth enamel. This will allow room for the veneer to work its magic and restore natural tooth form, enhancing brilliance and exceptional beauty. Porcelain veneers are an excellent solution for many esthetic imperfections such as poor color, shape or contours, fractured teeth, tooth position, as well as some minor bite related problems [Figure 1 and 2]. They are also an excellent option for managing superficial stains in teeth not amenable to bleaching. Much like a monarch's headdress draping over the head, a crown almost, if not entirely, replaces the enamel “cap” of a tooth. The term “cap” is used synonymously with crown. A crown replaces the entire external form of a tooth, down to the gum level [Figures 3, 4 and 5]. Whatever inner core of tooth remains, “crowning” a tooth re-establishes its natural form, as well as its function (how it contacts other teeth). Whether from the ravages of tooth decay or from trauma, replacing large amounts of tooth structure is part of crown design. Crowning teeth can also create dramatic improvements for patients whose teeth have been worn by bruxism (grinding habits) or by enamel erosion. The primary difference between a porcelain veneer and a crown is the amount of natural tooth structure that needs to be replaced. 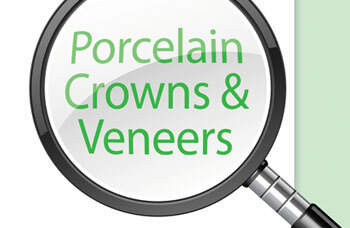 Generally speaking, greater thickness of porcelain is needed for a crown. In order to place the porcelain crown, at least 2 millimeters (mm) of tooth structure thickness is needed. For these two different restorative applications, the porcelain itself, a glass-like ceramic material has necessitated modification to strengthen it, particularly if used for back teeth, which are subject to higher biting forces.